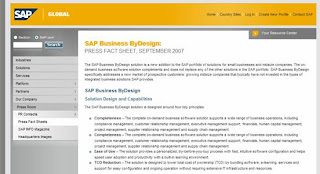 SAP announced its most complete on-demand Business Software Solution for SMB sector. The much awaited ( at least by the Enterprise Bloggers ) solution was designed around just 4 key principles. However, two of those principles seems to be completeness [ mentioned twice in the fact sheet of press release on SAP's site , may be just for the sake of completeness or to convey that redundancy is another ].